Algeria take on Ethiopia in one of this AFCON 2017 qualifying round’s standout ties, with the first of those ties taking place on Friday evening in Blida, Algeria and the reverse fixture on Tuesday in Addis Ababa. Omna Tadele of the excellent Soccer Ethiopia and SFG’s resident Algerian Maher Mezahi were both quizzed to deliver a 360 degree view of their respective teams’ status quo. Late last year it seemed like Christian Gourcuff was about to quit his job. What inspired the U-turn? Tactically, what should we expect from Algeria in this double-header? That’s a great question. Gourcuff has faced a lot of criticism for stubbornly sticking with a 4-4-2, despite its defensive flaws. Algeria used a 4-3-3 in their most recent victory and it was a resounding success. A tricky Tanzania side were quickly put to the sword and Les Fennecs walked out 7-0 winners. We’re not sure if Gourcuff will now revert back to his 4-4-2 or if he’ll continue with a 4-3-3. Sofiane Hanni was a late call up to the Algeria squad to replace the injured Hillel Soudani. Tell us a little about Hanni. When one looks through the squad list, it can appear that it’s becoming increasingly harder to make it into the Algeria squad. Is that a fair assessment? Hanni is leading the Belgian league in scoring from midfield. He’s a second striker with an eye for a pass and has now found a scoring touch to boot. He was always highly touted as a youngster at Nantes, but he left France due to behavioural issues. He then had very successful spells in the lower Turkish leagues and now the Belgian league. Hanni’s won himself a lot of plaudits this season and I do believe it’s but a matter of time before he’s playing in European club competitions. That’s a very fair assessment, especially in attacking midfield. I don’t need to introduce Sofiane Feghouli, Riyad Mahrez, or Yacine Brahimi who compose – in my opinion – the best attacking midfield in Africa. Factor in Rachid Ghezzal, who is having a stellar season at Lyon, imposing himself in the starting XI ahead of marquee signing Mathieu Valbuena. There’s also Hanni who is supremely talented, and Adam Ounas who I believe is the second best talent in France after Ousmane Dembele. Any Ethiopian players that you think could cause problems for Algeria over the two games? Shimelis Bekele is always a livewire that can wreak havoc from the wings. I’m also a big fan of Asrat Megersa who can be this side’s fulcrum in midfield. I have seen Gatoch Panom score some crucial goals so he is also to be respected. Prediction: Algeria 4-1 Ethiopia. The North Africans have too much firepower. They should comfortably beat the Walyas in Blida where they haven’t lost in 12 years. In 2013 we saw the re-emergence of Ethiopian football under Sewnet Bichaw and the same group of players. The last time these two sides met Mariano Barreto changed up the roster and took a gamble that didn’t pay off. What has Yohannes Sahle done with this side so far in terms of calling up new players or sticking with the old guard? The national side is largely dominated by members of the Walya’s CHAN squad. Yohannes has made no major changes. Forward Dawit Fikadu and goalkeepers Tarike Getenet and Lealem Birhanu are the only new inclusions. The trio were in the national team before so technically they are not new. The in-form Abdulkerim Mohammed of Ethiopian Coffee is basically the new face in Yohannes’s squad. He has only one cap for the national team, starting against Malawi in the 2015 AFCON qualifier. Yohannes is left with no option but to call some members of the Sewnet era – after all, they have got much needed experience. Yohannes has tried over 30 players in his one year stay with the NT. Players have been changing in the squad but it seems he has stuck with his CHAN team. Are fans in Ethiopia optimistic of getting anything out of the match in Blida on Friday? Apart from those fans who are blinded by uncalled-for national feeling, most fans are certain that Algeria will beat Ethiopia in Blida. The majority of the fans are not content with Yohannes, and the dislike towards the coach has made fans even more pessimistic. I have come across some fans that wonder how an Ethiopian player would be able to silence the red-hot Mahrez. This gives you an understanding that fans are expecting literally nothing out of the game. Some are even saying that if we lose with by a single goal margin then it is a blessing. 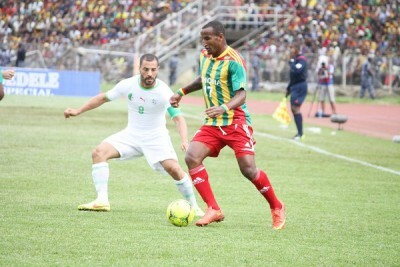 In Saladin’s absence, who is Ethiopia’s leader on the pitch? I would say Asrat Megersa. Since Sala and Seyoum Tesfaye pulled out of the squad Asrat will lead the team. Getaneh Kebede and Shimeles Bekele could also be the leaders. They are the three of the most experienced players in the squad. There is an air of pessimism around the Ethiopian team at the moment. Could you explain why this is? Obviously, it is because the team is playing one of the African football powerhouse. Plus here in Ethiopia people watch the English Premier League and they have been closely watching the magnificent season of Leicester City and Mahrez. Most people don’t believe Ethiopia could pull off a good result against the star studded Algerians, they know the national team is in a pretty bad shape. The current state of Ethiopian football is very poor and that in turn has made fans to lose hope with the national team. That induced a sense of disbelief among the fans. Nonetheless, still the fans are ready to back the Walyas. huge problem and it has exacerbated the cynicism before the game. The fans remain unconvinced by the remaining strikers. I know folks here in Addis Ababa will detest me for this prediction. I go for Algeria 3-0 Ethiopia. Maybe – and it is a big may be – we could get something out of the return leg.